Britain's Queen Elizabeth, left, and Malta's President Marie Louise Coleiro Preca visit Marsa racecourse near Valletta, Malta, Nov. 28, 2015. 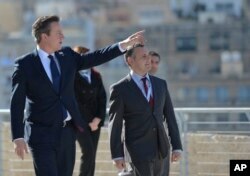 Malta hosts the Commonwealth Heads of Government Meeting until Sunday. Queen Elizabeth II on Saturday wrapped up a nostalgic visit to Malta, her one-time home, where she joked that Canada's youthful new leader had made her feel old. British Prime Minister David Cameron arrives at the St. Angelo Fort in the Three cities, during the CHOGM Commonwealth Heads of Government Meeting in, Malta, Nov. 28, 2015.